150 years celebration of Racing. 1864 is a symbolic year for both the Victorian Racing Club and Marea Bright Melbourne Milliner. As far back as 1864 when Marea’s maternal great grandfather, Samuel Pope Davis, won the Melbourne Cup on Lantern and to the present day, Marea and her family have had a life-long association with racing. Her father, the late Frank McIntyre and brother, both jockeys; her mother, Rita, a tailoress, all led Marea to fashion and millinery. In 1964 Marea qualified with a Diploma of Millinary and Design and has built a career and a proud reputation, stemming from her passion for quality workmanship and designing innovative custom made headwear. In 1999, the late Frederick Fox LVO, the Queen’s Milliner, invited Marea to London to assist him in his New Bond Street Salon where she attended to his high profile clientele on a day to day basis, along with managing production and staff. Since 2009, Marea has realised her lifelong dream of having an exclusive and specialised atelier and hat shop in Melbourne’s CBD. Marea’s salon offers the service and quality of yesteryear and Marea is continually inspired to create new season collections. Throughout a career full of personal and professional achievements, the following stand out as perhaps my proudest achievements. Her hats are not only beautiful but they are so comfortable to wear and they sit perfectly even in high winds at country tracks ! 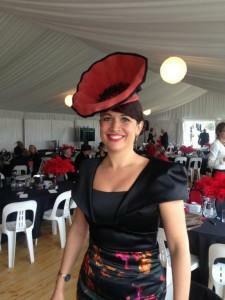 From winner of Wagga Wagga Gold Cup Best Hat Award, May 2014.